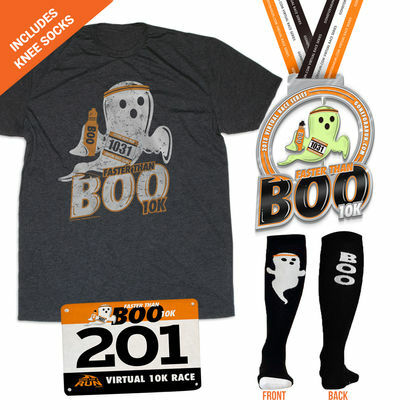 Running with SD Mom: Faster than Boo - Virtual 10K from @GoneForARuncom! 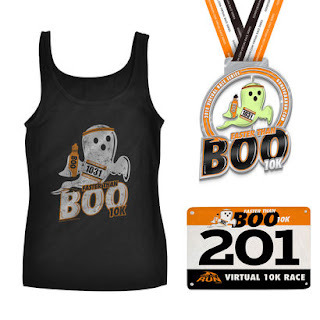 Faster than Boo - Virtual 10K from @GoneForARuncom! Disclaimer: I received a complimentary entrance into this virtual race in exchange for a review and an honest opinion! All opinions are my own! I am having the best time with the Virtual Races from Gone for a Run! I have done the Shark 5 miler, the Sole Sister 7 miler and the Beer Run 10K. All with super high quality medals, bibs and race tanks / t-shirts. If you know me well, you know I can't run in shirts. I go from tanks to long sleeves. There is no in between. So if a race has a cool tank, I am all over it! Welcome to Faster than Boo! Not only is the race gear a tank, the ghost "Boo" on the medal, glows in the dark! The version above is $32. Virtual race packet includes race shirt (either Women's Athletic Tank or Men's Lifestyle Tee), gorgeous finisher medal, real bib (no downloads!). If you buy the $40 package, you get the matching socks too! Just run or walk the 6.2 miles on the course of your choice during the weekend of Halloween. Race will be held October 29-October 31. Please be sure to share your race, photo’s and recap on their Facebook page at facebook.com/GoneForaRUN. Must order by October 19 to guarantee on time Halloween arrival! By running this race you will also be supporting an amazing charity. A percentage of your race entry will be donated to Friends of Jaclyn Foundation. The Friends of Jaclyn Foundation has enriched the lives of over 600 children and their families battling with pediatric cancer. Please read about Jaclyn’s story and the great success of the foundation at http://friendsofjaclyn.org/jaclyns-story. So, who is going to join me? Can't wait to run faster than Boo! I've never done a virtual race - this sounds like such a fun idea! !